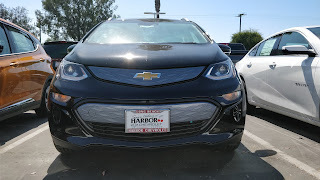 On the outside, the Bolt presents as something along the lines of a Honda Fit or Nissan Versa, a tallish hatchback with an oddly short nose and overly tall greenhouse. 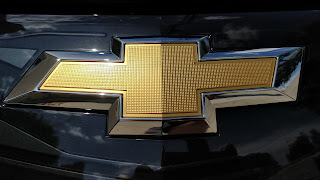 The front "grille" is a plastic inlay with a circuit-board inspired pattern and framed by large headlight nacelles with clean and simple LED DRLs. Starting from just behind the headlights and moving back is a distinctly Chevy design element on which the Bolt's model name is emblazoned, a trait shared with its sibling, the Volt. That character line expands into the side glass of the car and tapers again towards the end to form the separation area for the floating roof, a design element I generally find overused by automotive designers these days. 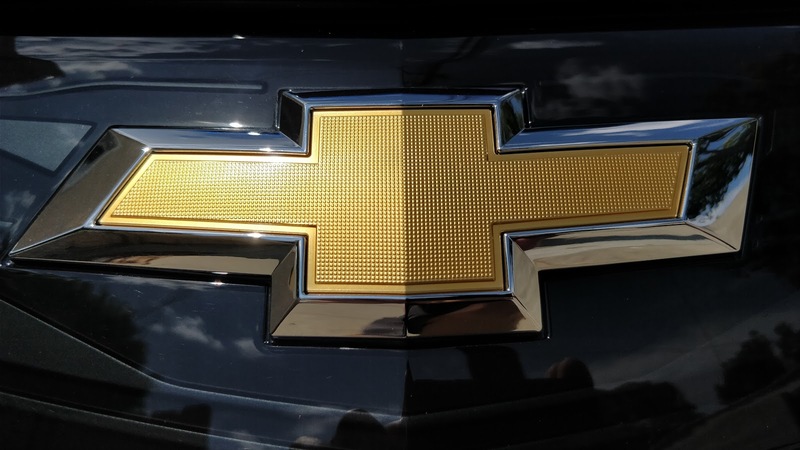 For the Bolt, however, it becomes necessary to reduce the visual height of the otherwise slab-sided design and seems to complement the blacked out portions of the wheels, which look a tad small with how tall the car is. 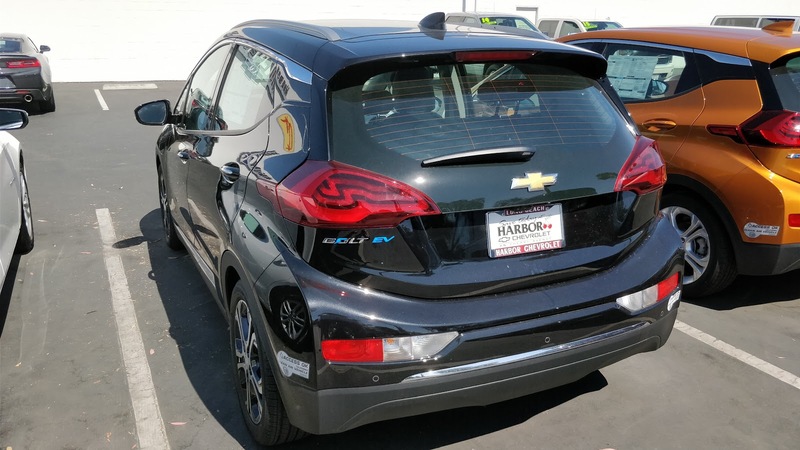 Around back, the tallness of the design continues to be the dominating visual characteristic, although the LED taillights carry a rather distinct and attractive pattern. Inside, the presence of a uniquely surfaced plastic trim sort of threw me off at first. It is a pattern without really much texture and is a contrasting white strip on an otherwise darker colored interior. To the touch, it feels almost like paper, but it is surrounded by a glossy hard-touch plastic. Luckily, the most eye catching element of the interior is the 10.2-inch touchscreen infotainment system. It provides a ton of information and looks sharp doing it. The standard color scheme is a little obnoxiously cheerful, but luckily there are settings that can remedy that. 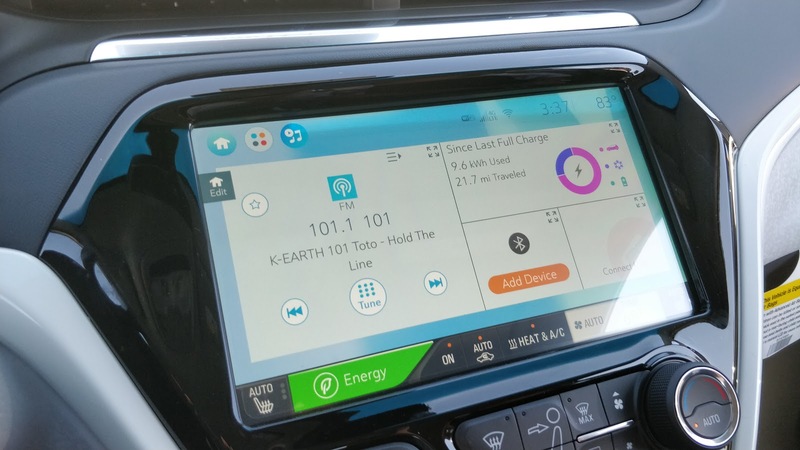 Paired with the infotainment screen is another smaller screen in front of the driver that serves as the instrument panel. 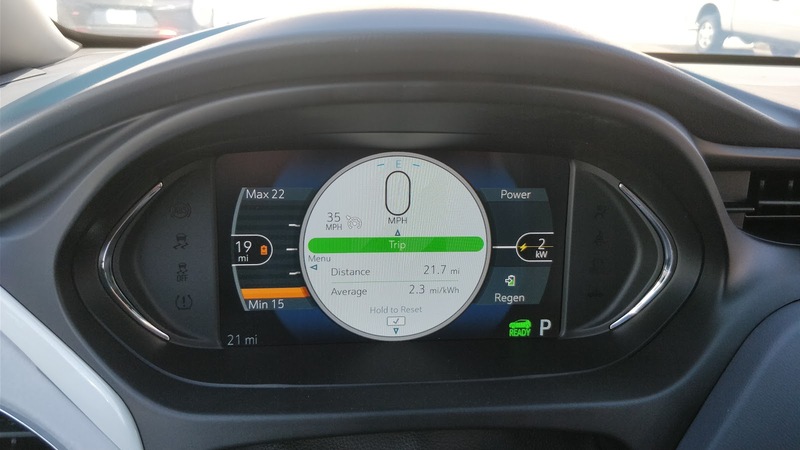 A totally digital speedometer shares space with elements that denote the state of charge, estimated mileage, and driving efficiency. Again, the saccharin color scheme can be swapped out for something more subtle. The rest of the controls are clearly parts bin pieces from other cars, but largely feel of quality, including the monostable shifter. Unfortunately, the rest of the cabin plastics feel pretty hard and cheap, even if they do not necessarily look it. The one overwhelming sense on the inside of the Bolt is airiness. 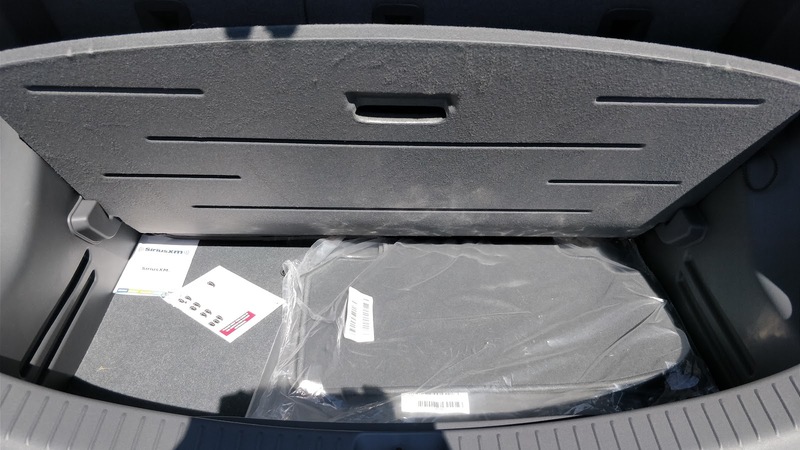 The front seats offer a slightly tall view of the road and tons of headroom. 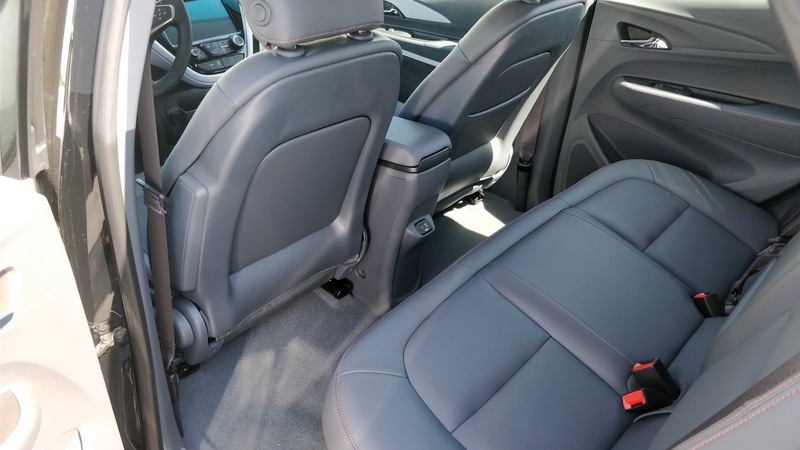 The rear seats are slightly elevated, which, when combined with the upright posture, cuts into the headroom a bit, but short of people with really long torsos, most people will probably find it quite comfortable. Those front seats are quite narrow and take a little getting used to, but if you are relatively slim, they fit rather nicely. Those who are a little wider of the torso or hips may find the seat uncomfortable, however, as the slim seat frame can dig in a bit if you are sitting against them for a long period of time. Press the glowing "Start" button and the Bolt springs to life with a flourish of dancing particles on its screens and a little jingle, a sure sign that this car was designed by Koreans (if you have ever owned a Samsung or LG washer or other home appliance, you'll understand what I mean). Press the button on the side of the shifter, the one on top is for Park, and slip the car into reverse to reveal a bright, but somewhat low resolution backup camera with guidelines as well as an overhead 360-degree view, courtesy of a camera in the bumper, one under each side view mirror, and the back-up camera on the hatch lid. This surround view camera is the best way to eliminate the need to open the door to check if you managed to squeeze the car into a tiny parking space and is one of my favorite features of newer cars. With the car set for forward progress, I dip gently into the accelerator and am greeted with the delightful rush of torque that I love from EVs. Only, this car delivers about 50% more of it compared to the shorter range competitors like our long-term Focus Electric. There is so much power that the initial acceleration feels more on par with our V6-powered Honda Accord than it does the Focus, which should not be surprising considering the Bolt delivers more torque than the Accord. The 0-60 times in the 6.5-second range are absolutely believable and would put this car in a class with the Focus ST and Mazdaspeed 3, both serious hot hatches. While the going is simply and straight-forward, the stopping comes with a variety of options. Of course, you have the traditional brake pedal with blended braking, meaning the first part of the pedal travel is regenerative braking only and used to recover the motion of the car into energy while the mechanical brakes only apply much deeper into the pedal travel. Then there is the regen paddle on the left side of the steering wheel, which engages the surprisingly strong regenerative braking -- strong enough that it can bring the car to a stop without the mechanical brakes at all. Finally, there is the "L" mode on the shifter, which engages "one-pedal" driving. 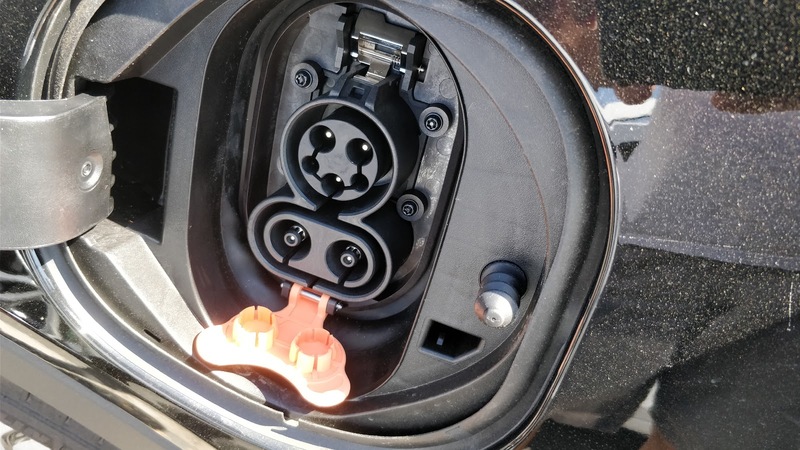 By kicking the regen in as soon as all pressure is lifted from the accelerator, "L" mode allows you to basically never touch the brake pedal except to make sure the brake lights are lit up at a stop. Driving this way takes a little bit of adaptation, but quickly becomes incredibly addicting. The first time I experienced this level of regen was with the Tesla Model S, but even the regen on that could not bring the car to a full stop. And the strength of the regen means that I am able to very easily fine-tune the weight shifting on the Bolt as it corners since I can dial in the amount of regen braking I need by adjusting how much force I use on the accelerator. Which turns out to be a really neat trick because the Bolt handles surprisingly well. With a short wheelbase, low center of gravity despite the tall body, and relatively stiff suspension, tossing the Bolt around corners proved amazingly gratifying. Being able to approach a corner and dial in the entry speed just using the accelerator and then modulate it smoothly to maintain the line in a corner shows me that EV race cars are going to have a truly bright future. If something this tall and goofy looking can drive this well, imaging what a slow-slung sports car body and grippier rubber could do on a track? Mix in the rather quick steering rack, albeit one that lacks much feel, and the Bolt proves itself a capable, if not exactly willing partner for some back roads time trials. All that prowess in the handling department, however, does translate into a bit of a stiffer ride. I found that Bolt's dampening over rough pavement to be merely adequate, though on smooth roads, it is quite relaxed to drive despite the short wheelbase. Get onto a really rough road, however, and the stiff springs and short wheelbase combine to make for a ride that reminds me a bit of old wooden roller coasters, which is to say a bit rough. A set of progressive rate springs would do wonders for the ride comfort so I look forward to seeing if this becomes enough of a problem that the aftermarket will tackle it. After cruising around in the Bolt for a little bit, tossing a roundabout or two at it and some quick corners, I returned to the dealer with a bit of a conundrum. The Bolt represents both what I absolutely love about EVs, with the instant torque and great efficiency, and what I hate about them, namely dorky looks. When my wife and I first got our Focus Electric, one of our main criteria was that the car needed to not look like a dorky eco-car, a la the Leaf. The Focus was the most normal looking of the available EVs at the time and carried one of the few liquid-cooled and actively temperature managed battery packs among its small group of competitors. That made our decision easy. 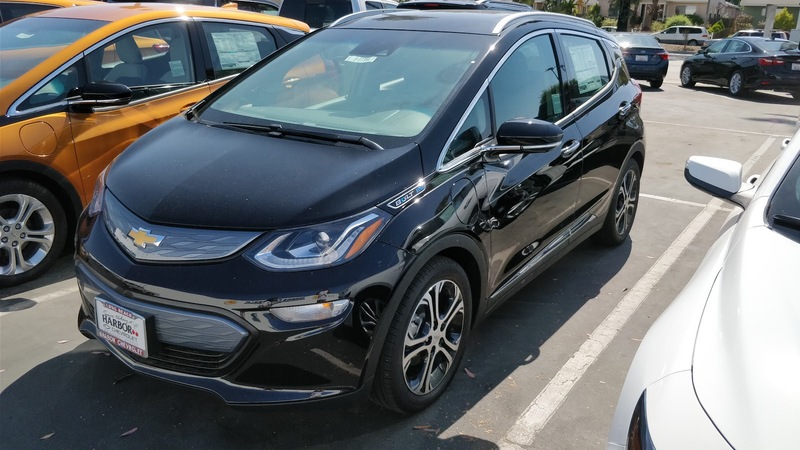 And while the Bolt is not in the same category of ugly as cars like the Prius and Prius Prime, it certainly isn't as sleek as its plug-in hybrid sibling, the Volt, and the ungainly tall proportions make it look odd from a lot of angles. Still, given how well it drives, the spacious and usable interior, and the monster battery pack with a huge amount of range, it seems foolish to dismiss it purely based on looks alone. Looking at it objectively, aside from a lack of style, the Bolt meets all of our other needs pretty well and does so in a relatively affordable package, especially with all of the rebates in California. While the Model 3 offers a lot of desirability, it also carries with it a large price tag and no possibility of a lease in the near term. 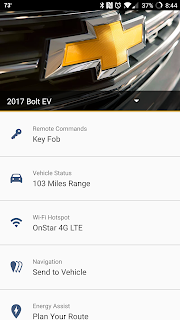 So taking the emotional aspects out, a Bolt would actually make complete sense, especially as the 238-mile range allows us a great deal more flexibility than we have now with the Focus. 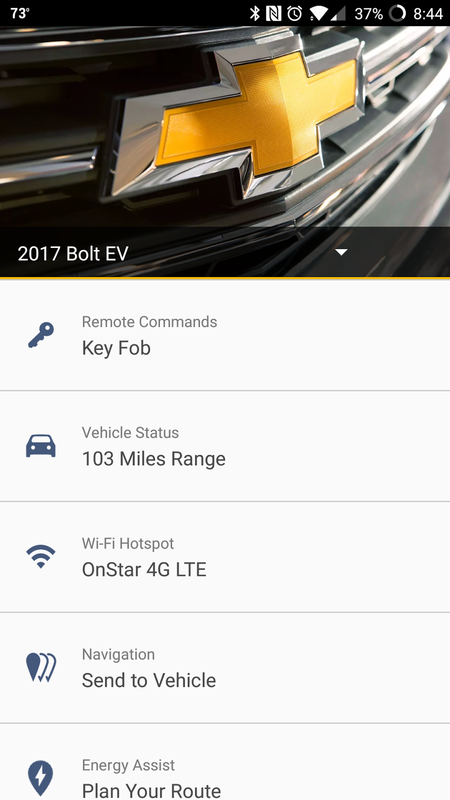 As I stated coming into this test-drive, I really wanted not to like the Bolt. But actually getting into it and experiencing the driving dynamics, genuinely impressed me. GM has done a phenomenal job of assembling a package that is fun and functional. While there is certainly room for improvement, the areas of improvement are things that can be addressed easily enough with minor updates and are not related to the mechanics of the car. This test-drive challenged my understanding of what I actually need far more than any other car I have driven before.